I used OPI Mod About You and a plain black creme. I saw Nicole over at Nail Polish Wars do a freaking amazing marble using these colors (you can see her post here) and I knew I just had to try the same combo. I only wish I could marble half as well as she can! But I will continue to practice. I did troubleshoot several issues I was having so hopefully in the future I will do one I'm happy with. I love these colors together, this is very pretty! Great color combo with the pink and black. 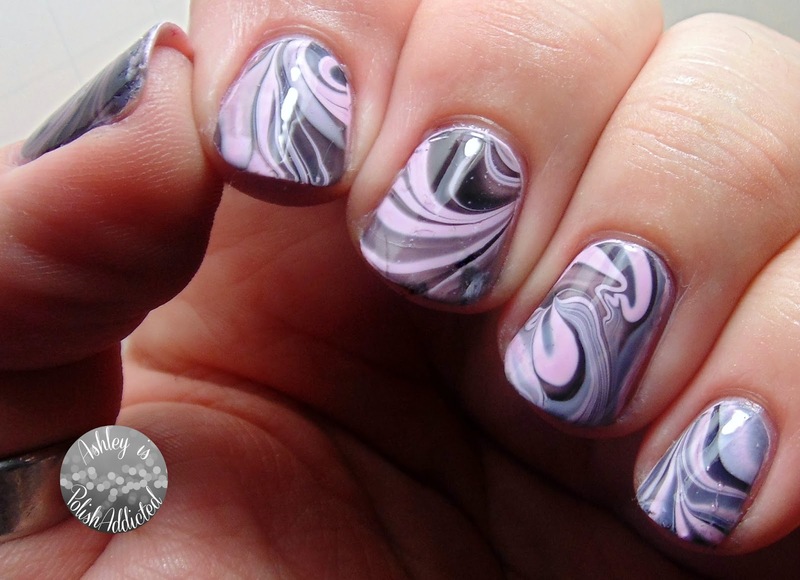 I like you middle nail best but the marble on the pinky has an interesting pattern too. These watermarbles are fun to look at as every nail comes out a little different. I've never tried the technique yet. I am impressed by these manicures.